Monday- Since today is a holiday, there is a group run organized this morning. I dedicated my morning 10+ to my dad – a Vietnam Vet. This is the first Memorial Day in a long time that I will not be spending it in KC with family. I am excited to see them next weekend when I go home for the Hospital Hill Half Marathon. Plus, the “cool” morning temps and sunrise made it totally worth it! Wednesday- Well…today was a little different! Since it was a little chilly for a bike ride, I wore my light jacket and decked out in some Brilliant Reflective BLING!! I am reviewing Brilliant Reflective strips again this summer, you can check out my last review as well – and my bike is one piece of gear that I didn’t BLING up last time! Are you digging the reflective BLING on my bike and jacket? You can totally get your own on Brilliant Reflective’s website and use the code “BRP35” for 35% off your online order! You can never be seen too well while out on the road…Check them out!! Thursday- I didn’t get out this morning due to some storms in the area…and I thought about going to the gym, but I stayed in bed. Since the hubs didn’t sleep well, I then got little man ready for the day and took him to daycare. I packed my bags and am ready for a lunch run! Friday- No morning or afternoon run – but after hitting up the Hospital Hill Runners Expo, I headed out to my volunteer post for the 5K. Since I was out there super early, I headed out to get a mile before my course marshal duties! Saturday- Hospital Hill Half Marathon! Since my 50M training should have started a couple weeks ago, I decided to see what my long run SHOULD have been this weekend…one of the three plans stated I needed 17 miles today…so I headed back out! While this wasn’t ultimately the plan I decided to go with for the remainder of my 50M training, it worked out well today! 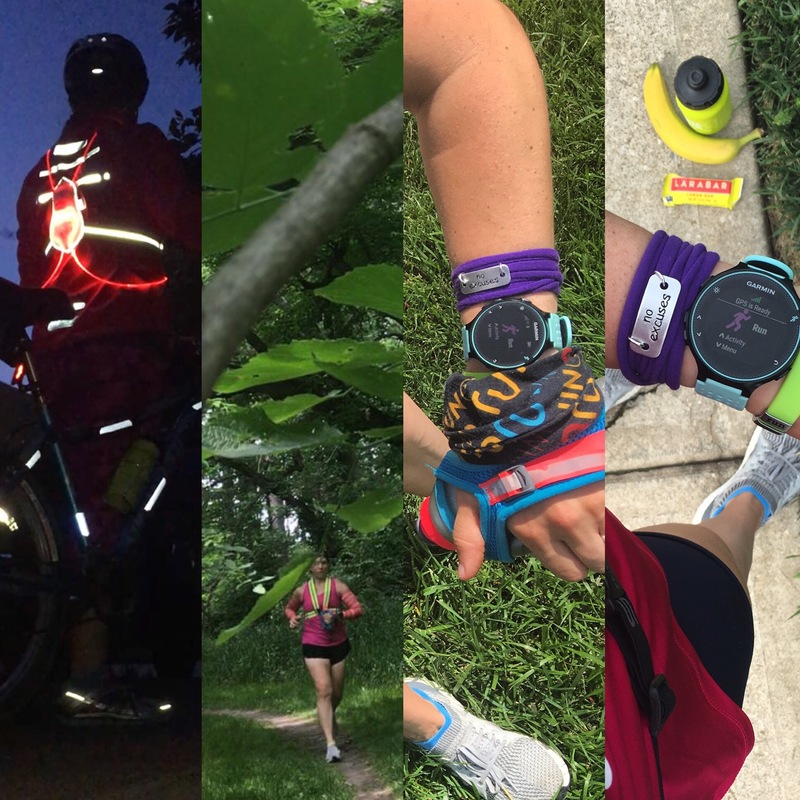 Sunday- 10 miles – heading out to the trails! Yay for your race – way to be smart in the heat! It can be so dangerous. Looking forward to your recap! Yay for picking a 50M plan! I can’t imagine running 50 miles… the hallucinations. The hunger. The training. YOU’RE AMAZING!! Your Hospital Hill medal looks awesome! I ran a 13.1 on Saturday and had plans to tack on an additional 5 miles afterwards…but the heat dictated that I leave it at 13.1. UGH! It got real hot real fast! Congrats on that nice new shiny medal! Kudos to you for running a half and then getting the extra miles in, that is impressive! We have no more cool mornings here, it is muggy as soon as you roll out of bed! Thanks for linking up! No more cool temps here too…summer is here to stay! Heat and humidity are my kryptonite. I totally lose all speed as soon as summer hits Virginia each year.